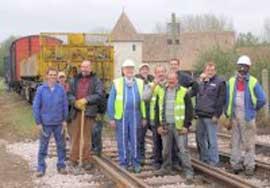 In addition to its main activity linked to the development of tourism, with the help of the regional and departmental councils the Eure Valley Railway has for several years been involved in professional rehabilitation schemes. Twelve people may benefit from a six month employment contract, with the possibility of renewal for three extra six month periods. Activities cover renovation of the station and line, with a whole range of jobs enabling each employee to express and improve his or her skills and professional know how. The work programme helps those identified as being in difficulty to obtain subsidized employment and to benefit from customized socio-professional assistance, the aim being professional rehabilitation and/or training. Getting back to work requires social, relational and professional skills which are developed throughout the duration of the contract. The work programme helps each individual to come to terms with certain problems, with the support of the technical supervisor, the socio-professional assistant and our social partners.